• Networks driven by business organisations representing the needs of SMEs and collecting their input must be strengthened and connected to academic networks. • The collaboration of SMEs and universities must be greatly improved to develop tangible, innovative solutions for individual companies or groups of SMEs in their regions and on a transnational level. • SMEs need also to cooperate strongly with each other, the transfer of best practices between companies needs to be supported. Such a specific infrastructure for the support of innovation in SMEs should be based on the integration of already existing organisations, whose capacities, experience and long lasting contacts with SMEs are a sound basis. Using and pooling existing resources reduces costs, saves time and ensures success in the long run. 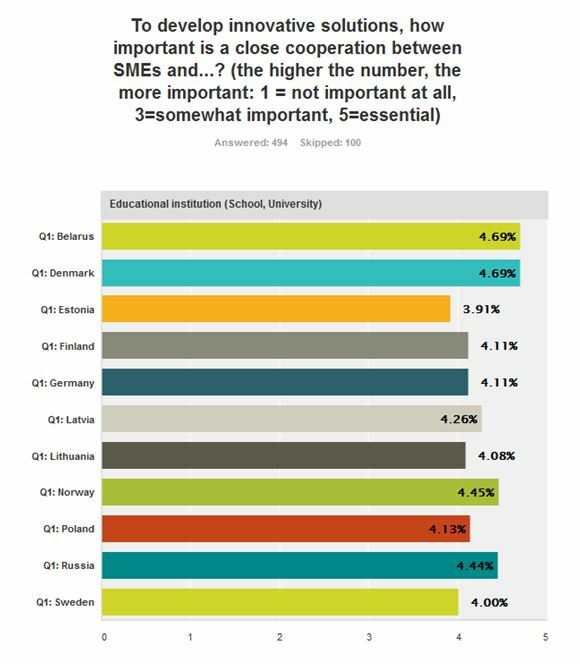 Networks need to be built on the respective regional strengths and connected on a transregional level in the Baltic Sea Region, bringing smart specialisation to its true meaning.